It seems I have eaten these plum dumplings all my life, and remember my Austrian mother telling me that when she was a teenager and lived in Dobrovic, Croatia, she and her siblings, a sister and a brother, would be in competition to see who would eat the most of these dumplings at one time. Mother having been the oldest ate 14 of these at one occasion …and won the competition. Looking at her in amazement since she was a person who never overate and always ate small portions. It was a special holiday for me when mother made these Zwetschken Knoedel, I have loved them as long as I can remember and learned to make them as an adult. Now I make them whenever I want to satisfy my hunger for something that reminds me of my childhood and our home in Croatia. These tender little morsels have become my special “food bliss” as I eat them by myself on days when my husband is not at home because he does not share my passion for them. Here is the recipe, hopefully you will try to make them and will feel that they are very satisfying in more ways than one. 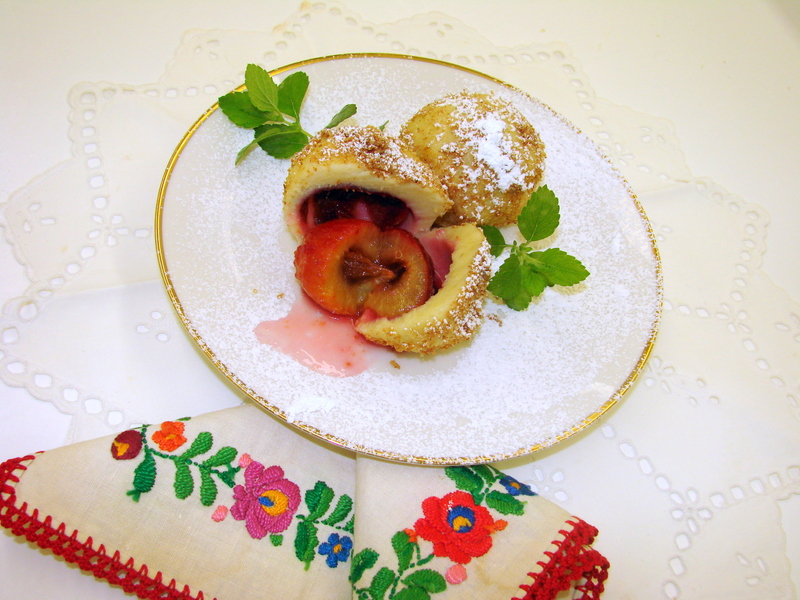 It is important to use Italian Plums…any other plum is too large, and cutting them in half will cause all the juices to drain out of the dumpling while being cooked. 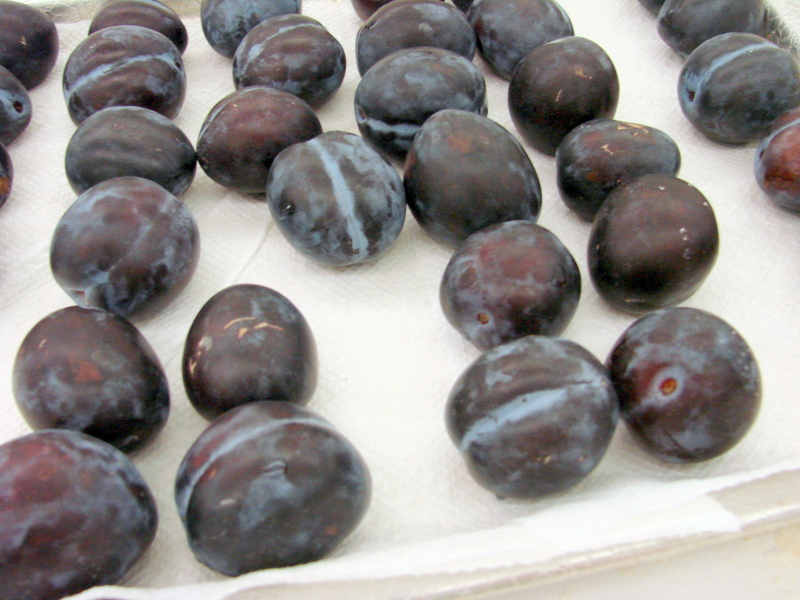 8 to 10 or more…Italian plums…. Some extra flour if needed…..
Toast the bread crumbs with unsalted butter and when cooled add a Tbsp of the sugar and set aside. 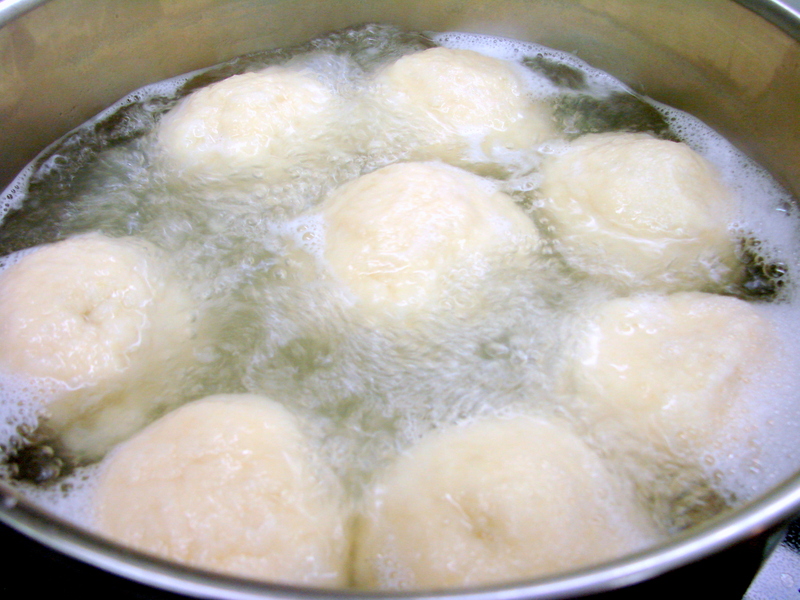 Start to heat a pot of water…..and bring it to a simmer while you make the dough and making the Knoedel. On a clean surface place 2 cups of flour, make a well and add the riced potatoes. With your hands mix the flour and the potatoes just slightly, then add the eggs. With your hands or with a wooden paddle mix all ingredients then, knead to make it into a soft dough. 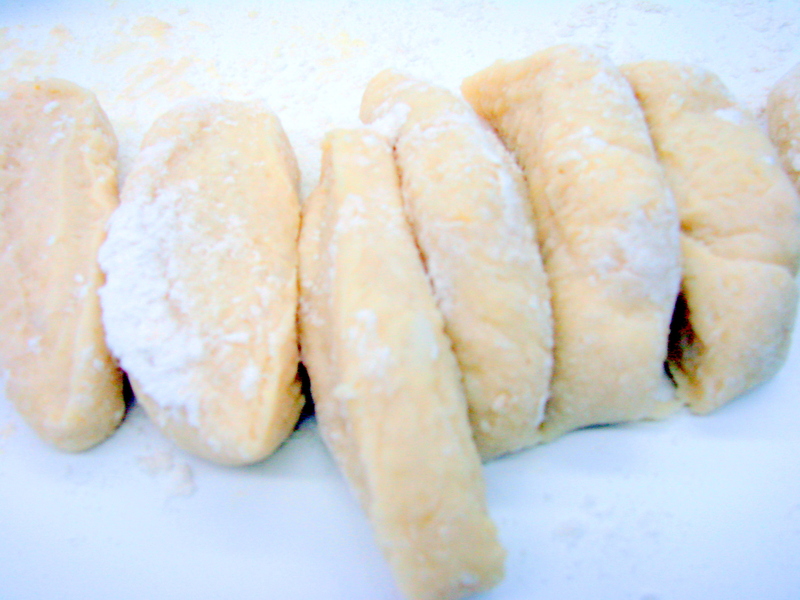 Note: This potato dough is not a noodle dough, it is a gnocchi dough. If it feels sticky add a little more flour and continue kneading just long enough to incorporate the added flour and it no longer feels sticky. Also….Notice I did not add any salt to the dough. Salt draws the moisture out of the potatoes and makes the dough very sticky, therefore, NEVER add salt to a potato dough. 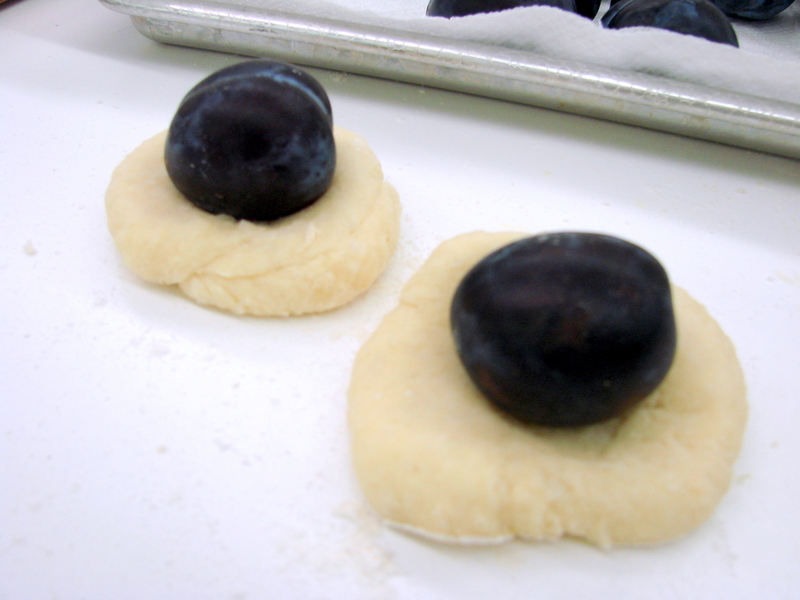 Cut pieces of the dough large enough to encase a plum. 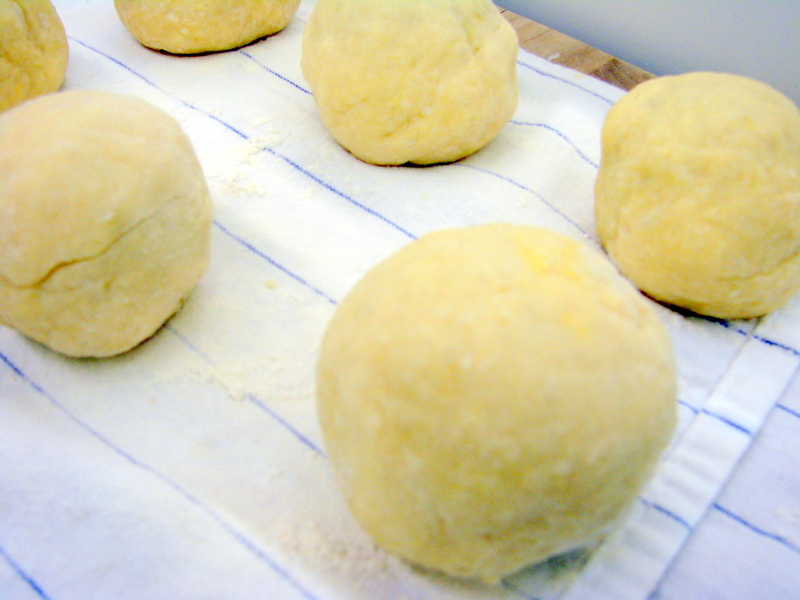 Roll the Knoedel between your hands like rolling a ball. When all the plums are encased and all the dough is used up……drop the Knoedeln into the simmering water. Note: It is important that all the seams of the dough on the Knoedel are well sealed. Cook the Koedel about 15 to 16 minutes. With a slotted spoon remove the Knoedeln from the simmering water and place them into a Pyrex baking pan, and keep them warm in the oven. 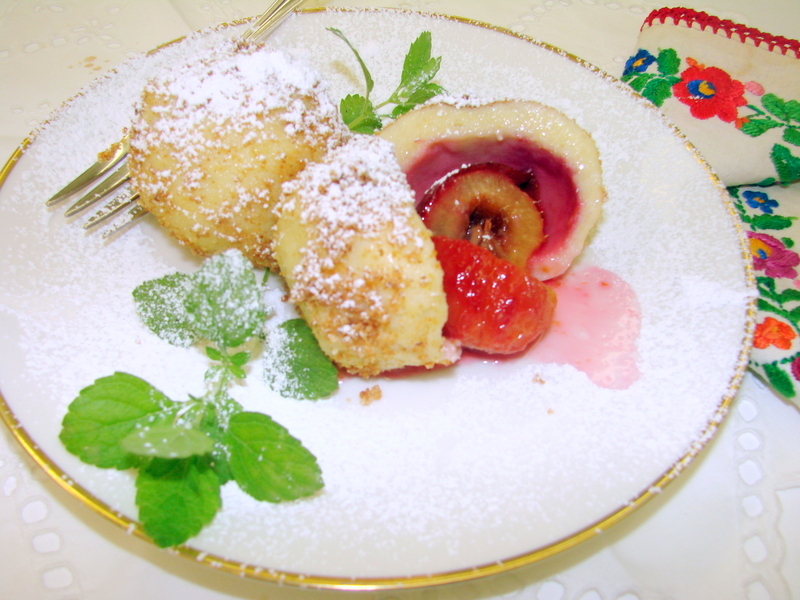 Just before serving – roll each Knoedel in the toasted bread crumbs that have been sweetened with crystallized sugar. I like to serve these Zwetschken Knoedeln as a lunch or a light supper with a dollop of Sour Cream and sprinkled with powdered sugar. OH Maria! This is on my must-try list!!! What a great post! ~ Mel. What a surprise it would be for them to find these Plum Dumplings at your table one day. Hi Devaki….it is so nice to hear from you….I love your cheerful and inspiring comments…thank you! What a delightful reminiscence of my own childhood in Bavaria. Question: for the dumpling dough – and to save time – can one use Panni’s Raw Potato Dumpling mix? I would think that Pani’s Raw Potato Dumpling mix would work…I have not used it, but it sounds like it would be fine to use…. We had those eating contests, too, when my grandmother made Rohrnudeln or Hefeklösse. Usually my cousin won, he would devour 6 large yeast dumplings, I think I managed only 5. Now I make them for myself and freeze them before I roll them in the toasted bread crumbs….Dale has not eaten any of the Knoedel that I make since my mother died…..He threatens me that he would go to McDonalds for dinner if I had them on the table….